Can you give your opinion if the glass on the photo was really tempered? Are these kind of glass fragments evidence of proper tempering? What do you think causes the appearance of long and narrow glass knives in different fractures? Is it possible to prevent the appearance of these knives, and what steps are required for that? There seems to be a growing market for different kind of fire-resistant glass solutions. Is there something special in the tempering line that can process glass for FRG applications? Can you give your opinion if the glass on the photo was really tempered? Are these kind of glass fragments evidence of proper tempering? What do you think causes the appearance of long and narrow glass knives in different fractures? Is it possible to prevent the appearance of these knives, and what steps are required for that? 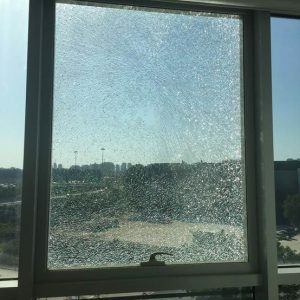 The glass breakage pattern depends on the initial breakage point as also the external stress conditions, like bending or the glass frame. Glass also needs internal tensile stress for fragmentation. Usually, a standardized breakage test (EN12150-1) is made so that the initial breakage point is close to the edge of the glass pane. Therefore, the first pieces have space to move away from the glass. However, in the case seen on the photo, the glass initial fracture point is in the middle of the glass. Plus, it might be so that the glass has been bent or framed when the fragmentation has happened. Because the glass needs tensile stress for the breakage, and in this case the fragmentation has started from the middle, the first fragments are increasing the compression in the center of the glass, and that is decreasing the possibility for the fragments to split. This is why you are getting these long shards as a fragmentation pattern. To avoid this kind of shards, the stress level has to be increased. And this is exactly what is required for the automotive glass where the standardized test (ECE R43) is made so that its initial fracture point is in the middle, and the standard defines how long exactly the shards can be in the fragmentation. At the moment, the FRG is a quickly growing market. And the question is a difficult one. There are many different things that need to be considered when designing the glass to be FRG. One thing is that there are different classifications of FRG depending, for example, on intensity and integrity. These have certain limitations in terms of the time that the glass needs to stand the heat. When you know these classifications, they set certain requirements for the glass surface compression. In FRG glass that is done as a deep-tempered glass, the difference is that this glass has a much higher surface compression. So to answer the question, the main difference is that the FRG tempering line is able to create a much higher surface compression level than the traditional ones. There are several different options how these can be achieved. It can be done either with a more powerful quenching system, assistive compressed air system or by heating the glass to a higher temperature, for example, with a dense rollers conveying system or using an air flotation heating technology.